This snack always reminds me of my childhood. Mom always made this snack when we had guests. 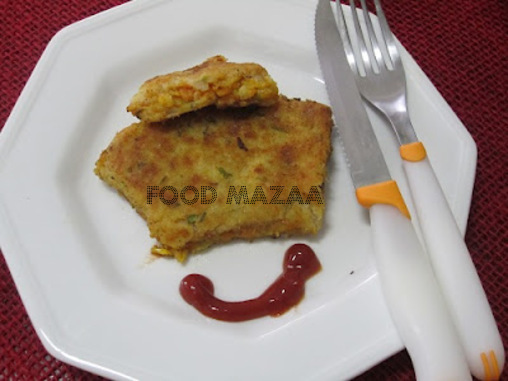 We prepare the potato like we do for the cutlets and stuff it with masala macaroni. You can adjust the spice level according to your taste. Boil the potatoes and mash them. Let it cool and then add all the above mentioned ingredients. Set aside. Heat oil in a pan and add the garlic and onion. Saute for a few minutes and add the tomatoes. Cover until they are cooked. Now add all the spice powders and salt and ketchup. Let it cool. Finally stir in the (macaroni) pasta and mix well. Let it cool before using. Bread crumbs ... 1 cup for rolling. 1. Spread a plastic sheet or cling film on the table top / kitchen platform. 2. Sprinkle a handful of bread crumbs. Take half of the prepared mashed potato. Pat it with the hand into a round shape about half inch thick. 3. Similarly make another one of the same size. 4. Spread the filling on it and carefully lift the plastic sheet to place the other one on top of it. 5. Press it again with the palm to make it firm and even. 6. Sprinkle bread crumbs on top. 7. Heat a little oil in a non stick pan and shallow fry the slices turning them carefully until crisp. Another very nice treat. I have learnt a lot since I started following you! Hi SHobha, this is a great dish. Nicely done and very well innovated. 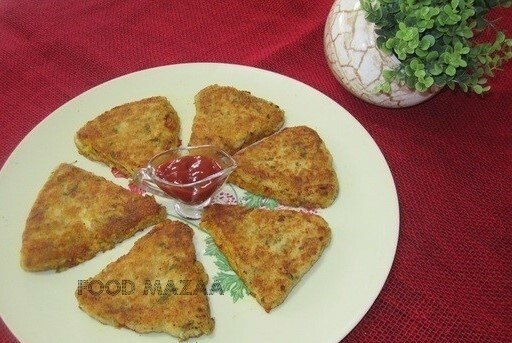 another interesting recipe :) very innovative..
Yummy. Diff variety with pasta. such a cute idea to stuff pasta in potatoes:)) Have a wonderful week ahead shobha. Love & Regards, Sonia !!! Very interesting.. Looks delicious and inviting.. Innovative idea and kids friendly too! Wonderful and very interesting recipe. Love to try it soon. wow..this is superb ,fantastic,healthy ,guilt free one,Shobha..Yummy!! Great recipe. Must try it soon. What a wonderful idea for a recipe - and perfect comfort food! wow!!Fantastic! !I am sure this is so delicious!! This is new to me..I'd love to try it soon..Looks so yummy.